Martin Hoshino, administrative director for the Judicial Council, updates council members on the response to the state auditor's report. SACRAMENTO—At a public meeting on February 19, the Judicial Council’s Administrative Director Martin Hoshino announced that high-level council staff will start contributing to their retirement accounts and cease receiving a monthly parking stipend effective July 1, aligning their benefits with the rest of the council’s staff. In addition, council staff will reduce its business vehicle fleet by a third, and will limit the use of contractors to no more than one year in duration without approval from the council’s administrative director or chief administrative officer. These cost-cutting measures were announced as part of a progress report on a working group charged with reviewing recommendations made by the California State Auditor on council operations and spending. An official response to all of the audit recommendations is due to the state auditor by March 7. The working group will also provide another update at the council’s April business meeting. Implementing Strategic Plan for Language Access in the California Courts: California Supreme Court Associate Justice Mariano-Florentino Cuéllar, chair of the Language Access Plan Implementation Task Force, provided an update on proposed areas for focus, anticipated outreach to stakeholders, and potential challenges for implementing the Strategic Plan for Language Access in the California Courts, which the Judicial Council adopted at its business meeting last month. 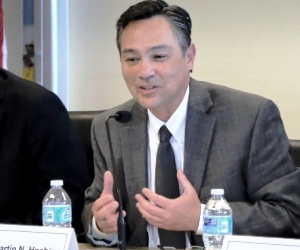 He also announced that Ventura County Judge Manuel J. Covarrubias will serve as vice-chair of the task force, whose members will be named soon. Grants to Help Reduce Recidivism by Adult Offenders: The council approved recommendations to allocate $13.654 million in grant funding for 27 superior courts from the Recidivism Reduction Fund Court Grant Program. The Legislature directed the council to develop and administer a competitive grant program for trial courts that use practices known to reduce recidivism. The approved funds will go toward pre-trial programs and collaborative courts. Reserve Funding for Earthquake Damage in Napa County: The council approved a request for $187,000 in supplemental judicial branch funding for the Superior Court of Napa County. The supplemental funding will address relocation costs due to the significant earthquake on August 24, 2014, which required the immediate closure of Napa’s historic courthouse. The court also applied to FEMA for emergency funding; if approved, the Napa court would reimburse the judicial branch trial court reserve fund. Changes to Court Technology Programs: The council approved recommendations on: changes to a number of statewide technology programs to achieve approximately $1 million in savings in the State Trial Court Improvement and Modernization Fund; forming a working group or tasking an existing council committee to focus on technology-related efficiencies and cost-saving measures for small courts; and directing its Information Technology office to consider replacing its external contractors with employees. Presented to the council by its Technology Committee and Trial Court Budget Advisory Committee, the recommendations also reflect input from court executive officers and court information officers. Proposal to Strengthen Information System Security and Data Reliability: The council approved a budget change proposal to request additional state funding to improve the security of judicial branch information systems. The proposal is a follow up to action the council took in August 2014, when it approved a conceptual budget change proposal for funding the additional work needed to address recommendations from the California State Auditor. An archived audiocast of the entire meeting broken out by topic will be available on the February 19 council meeting webpage later this week.